The Restrap Saddle Bag Holster & Dry Bag is 100% handmade in Yorkshire, England and features excellent craftsmanship. The bag is a hard case for easy loading and is fastened with reflective military paracord and reinforced eyelets. Made from 1000D military-grade Cordura and with nylon webbing for extra strength, this product is made to last. 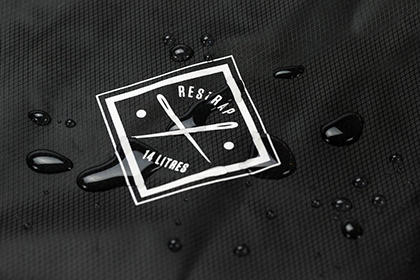 The Restrap Saddle Bag Holster & Dry Bag comes with a 14-litre dry bag but is still compatible with the smaller dry bags produced by Restrap. The dry bag is secured using a patented magnetic buckle that is incredibly easy to adjust, even when wearing gloves. If you want a serious piece of bike packing kit that has been hand made with pride and care then you can't beat the Restrap Saddle Bag Holster & Dry Bag. Restrap Saddle Bag Holster & Dry Bag is rated 4.7 out of 5 by 6. Rated 5 out of 5 by HEYRICK from Cool Looks and Neat Fixings Somat different to trad saddlebags. Q/R fixings are useful, tho require some practice (for my security concerns, I used with cable lock) There is plenty of adjustment, I was able to wrap 'footprint' around supplied dry-bag which held u/l one-man tent, with spare room for other items. The shock cord held bike cover whilst still leaving room for fitting a mudguard. In use the holster proved very stable, not requiring any further adjustments after loading, while on the road. To be fair, I only used it on bike for outward/return travel, so not able to comment on it's suitability for daily use e.g. commuting. Although the materials and magnetic catches look fit for purpose, I haven't tested product in extremes of wet or mud! Rated 5 out of 5 by JurijsYuri from This is quality Bought it for my 9 day solo ride across Britain from John o’Groats to Lands End. Packed all my main stuff in it. I’m more road cyclist than advenurer and needed to be lightweight as possible. Even it’s 14L, I forgot about the bag under my seat after few miles. Also important - it’s easy to get bag from bike when you need to leave it. Recommend. Rated 5 out of 5 by Side from Works very well Used this for a 4 day 450k trip across Scotland with camping gear which was 50/50 on and off road on a Marin 4 Corner bike and it worked a treat, very stable on and off road, easy to fit with plenty of adjustment. It rained a lot but kit still stayed dry. Rated 4 out of 5 by shufflingB from Good, could be excellent I've used this bag and holster arrangement a couple of times for some fairly serious off-road adventures. First traversing the Ridgeway just after Easter in the crap weather, and last weekend during the Distance event in the Peak district. I used the dry bag to hold all of my clothing, sandals and toiletries. Whilst the holster not only held the dry bag, but also the poles for my MSR Freelight tent. It's weaknesses, relative to the competition, are: 1) No air bleed valve in the dry sack. 2) No way to attach external luggage, e.g. jackets, bike locks, to the holster without the faff of having to get off the bike, loosen, attach and then re-tighten the main dry bag. Ideally, it would also have a nice way to attach a rear light at a reasonable angle. Whilst on the plus side it is empirically, very robust, water proof and when done up very tightly does not waggle. So for me, a solid four star performer. If I was in the market for another one, I would probably want to look at other options, but if I was in a rush, I would also be reasonably happy to buy this again as a safe option. What does this weigh? What is the dry bag fabric? Denier, construction etc. The only information we can retrieve on this is that the bag is fastened with reflective military paracord and reinforced eyelets. Made from 1000D military-grade cordura and with nylon webbing for extra strength. For further information please try the manufacturer directly. What clearance does this bag need between the saddle and wheel? The recommended clearance is 20cm (7.8&quot;) for large and 15cm (5.9&quot;) for small bags.